If you have in program to visit Rome in the summer and you hate crowds, I'd suggest you to to visit the Vatican Museums and the Sistine Chapel by night. You'll enjoy the Museum without the big tour groups in a nice Roman evening. During those special evenings we can visit Pius Clementinus Museums (Ancient Art), Gallery of Tapestries, Gallery of Geographical Maps, and the Sistine Chapel. 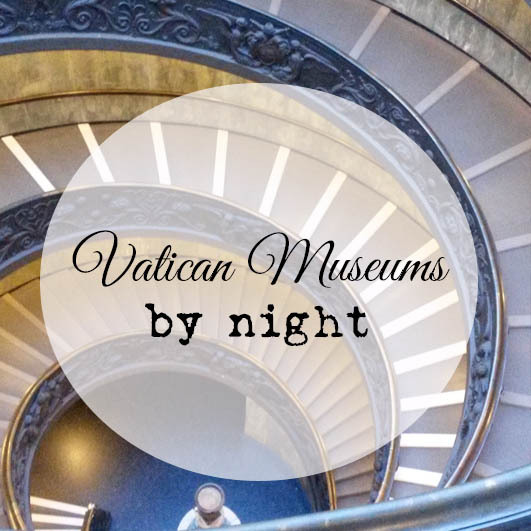 If you're coming to Rome in the 2019, a visit to Vatican Museums by night is a must, the only chance to enjoy some quiet in the Sistine Chapel. Meeting point: At the Vatican Museums main entrance. Details will be provided at the moment of the booking. Admission tickets are not included. Tickets must be booked at least a month before your tour. I can take care of the reservation of the skip-the-line tickets (21€ a head). Vatican tickets are only valid on the selected date/time no change or refund is possible (even in case of a tour cancellation).